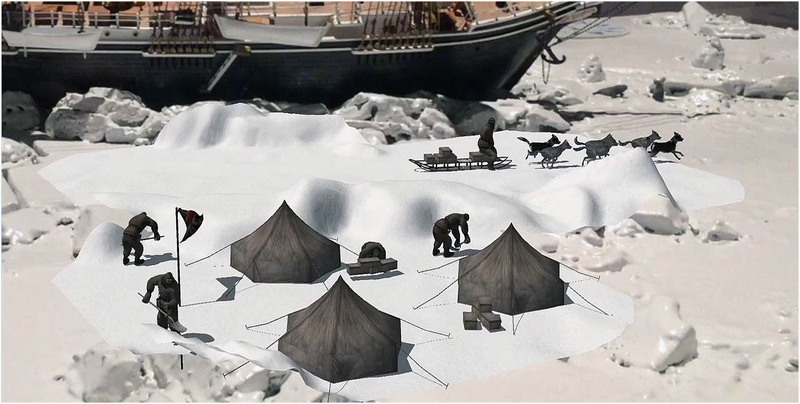 Set around a physical replica of the Endurance, small AR vignettes flesh out life on the ice for the crew of the Endurance. The creative process contained several feedback loops between the virtual and physical. We started with a "physical" model of the ice flows (based on the Frank Hurley photographs),which was then scanned using 3d photogrammetry, so the sections of the AR-overlaid landscape fit perfectly with the model below it. 3D printed figures were placed on the landscape, created from the renderings of our artist Jack Crosby.